Blake and Jennifer Freking live in Finland. Their off-the-grid home, nestled in the woods on the north shore of Lake Superior, lies about 30 miles from the Canadian border. It’s a place, notes Blake, where Mother Nature always has you under her thumb. “This particular spot in Minnesota gets more snowfall than the rest of the state, by far,” he says. It’s the perfect place for the Frekings, who are a musher family. They care for some 60 Siberian huskies and have competed in long-distance dogsled races including the Yukon Quest and the John Beargrease Marathon — a 400-mile race through northern Minnesota that is a qualifier for the famed Iditarod race in Alaska. The Frekings have competed in that grueling contests as well. 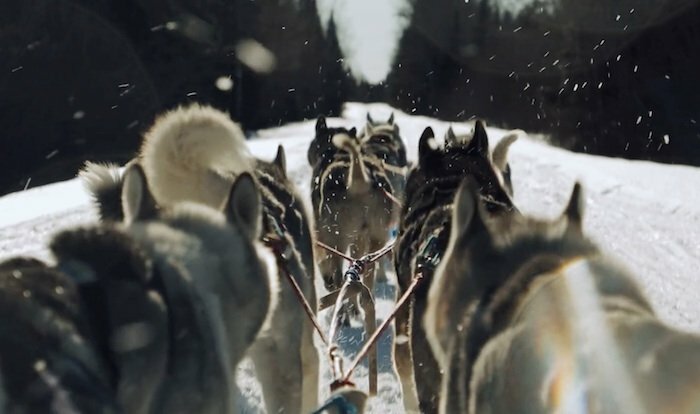 The film was shot over a three-day visit to the Frekings’ home in March 2018 and an additional two-day trip to northern Minnesota in January 2019, when Chapman followed Blake and Jennifer as they competed in the Gunflint Mail Run — a dogsled race through Cook County, MN. “Timing was a challenge during this project, as the distances covered are often long and the chances of capturing a mushing team during a race are slim,” notes Chapman, a PPD reader. Working in waist-deep snow presented challenges as well for Chapman and a crew from the Minneapolis-St. Paul creative community. Chapman shot the project with two Canon EOS-1D X Mark II cameras, a variety of Canon lenses, a MoVI M5 gimbal stabilizer, a Marantz PMD-661 handheld audio recorder and a Sennheiser MKH-416 shotgun mic. He also used a DJI Drone for aerial shots.